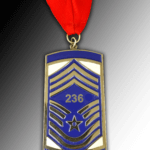 We needed medallions for our SNCO Induction Ceremony and Celebrate Excellence saved us! We are all the way in Colorado and they answered our request for information promptly. They were extremely professional while working with us on a design and the final product was just what we envisioned! They were very responsive and friendly! I would recommend them to anyone looking for a professional product — even if you are across the country! Thank you, Celebrate Excellence!